Knitted in a multiple of 10 sts and a 4-row repeat. Row 1 (Wrong side): * Knit 2, purl 6, knit 2; repeat from * to end. Row 2 (Right side) : * Purl 2, (knit 2 sts together but do not drop from left-hand needle; knit the first stitch again and slip both together from the needle) 3 times; purl 2; repeat from * to end. Row 3: * Knit 2, purl 6, knit 2; repeat from * to end. 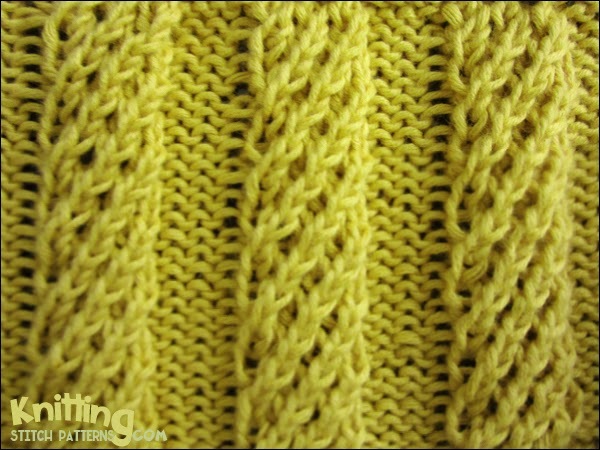 Row 4: * Purl 2, knit 1, (knit 2 sts together but do not drop from left-hand needle; knit the first stitch again and slip both together from the needle) twice, knit 1, purl 2; repeat from * to end. Repeat rows 1-4 until you have reached your desired length.